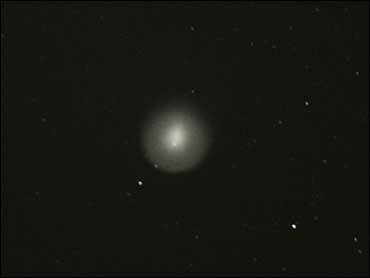 A comet that unexpectedly brightened in the last couple of weeks and is now visible to the naked eye is attracting professional and amateur interest. Paul Lewis, director of astronomy outreach at the University of Tennessee, is drawing students to the roof of the Nielsen Physics Building for special viewings of Comet 17P/Holmes. The comet is exploding and its coma, a cloud of gas and dust illuminated by the sun, has grown to be bigger than the planet Jupiter. The comet lacks the tail usually associated with such celestial bodies but can be seen in the northern sky, in the constellation Perseus, as a fuzzy spot of light about as bright as the stars in the Big Dipper. Scientists speculate the comet has exploded because there are sinkholes in its nucleus, giving it a honeycomb-like structure. The collapse exposed comet ice to the sun, which transformed the ice into gas. Experts aren't sure how long the comet's show will last but estimate it could be weeks if not months. Using a telescope or binoculars help bring the comet's details into view, they said.